This post was written in recognition of Child Abuse Prevention Month. My first realization that not all parents behave as loving parents was in the third grade with news that Penny’s mom had hit her over the head with a trophy. It was shocking, as child abuse was not a topic you typically heard of in the 70s, but conversations soon sprouted throughout our small suburban school and community. Fast forward to today, and news of children being neglected and abused is far too prevalent. Every child deserves to grow up in a safe and loving environment and it is our duty as parents, educators—as humans—to look after them. 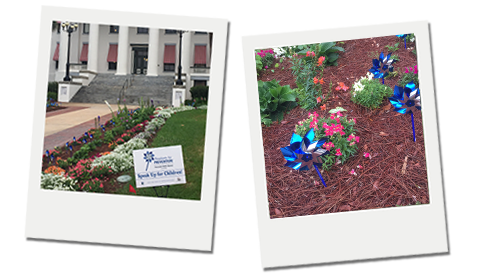 Over the past few weeks, you may have noticed pinwheels have popped up in your community and throughout Florida. A ceremony was held in Tallahassee earlier this month on the lawn of the Turlington Building, which serves as the home of the Florida Department of Education. 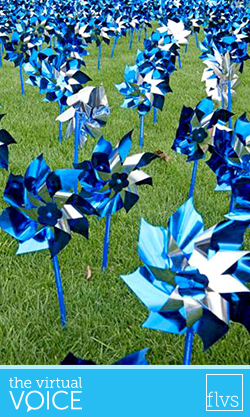 These pinwheels represent Pinwheels for Prevention, a national campaign that engages communities in a coordinated effort to prevent child abuse. The organization promotes the awareness of healthy child development, positive parenting practices, and the types of support families need within their communities. 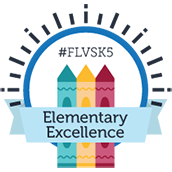 Prior to my role at FLVS, I worked at a large elementary school with high student turnover in Central Florida. There, I had a front-row view into some of my students’ home lives. I had a child burst into tears when his behavior card was moved down for acting up. This was not uncommon, as most children dislike being called out for doing wrong, but when he cried that he didn’t want to get another “ice shower” as punishment, well, that raised some concerns. As did seeing a second-grade little sweetheart being left in the school office at least once a week as his single parent would fail to pick him up for hours. In both instances, investigation and intervention were necessary. 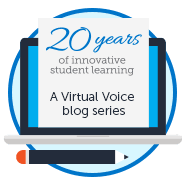 Before a child can thrive academically, the child’s health and well-being is essential. We each have a role in preventing child abuse and neglect in our communities. Pinwheels for Prevention helps raise awareness about this very important issue and serves as an ongoing reminder that we all have a great responsibility to our children. The colorful little pinwheels will remain on the Capitol lawn throughout April to symbolize the promise of the happy childhoods all children deserve. It is very important to recognize and report signs of child abuse and/or neglect. Everyone needs to be mindful of the children they interact with every day. The Pinwheels for Prevention campaign reminds us to take action to help ensure children live happy, healthy childhoods. Florida law requires everyone to report known or suspected child abuse to the Florida Department of Children and Families, online here, or by phone at 1-800-96-ABUSE (1-800-962-2873). This entry was posted in Educator Edition, Parent Edition and tagged Child Abuse Prevention, Child Abuse Prevention Month, Child Safety, Community Involvement, Family Support, Pinwheels, Pinwheels for Prevention, School Community on April 18, 2017 by Suzan Kurdak.